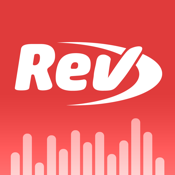 Rev Voice Recorder by Rev is a business app that provides you with a simple way to make voice recordings. Rev Voice Recorder by Rev is a business app that provides you with a simple way to make voice recordings. The app is an audio recording and transcription app that contains no ads at all despite the fact that it is completely free. Use this app to record notes, memos, meetings, lectures, and interviews. This dictaphone app was updated on June 17, 2013 and is available in English. The app was designed to be powerful and simple so that you could easily record audio whenever you needed. Not only that, but the app features extremely impressive sound quality so you aren't straining as you listen to the audio you recorded. Features of this app include being able to edit your recordings and organize them on your iPhone, download with iTunes sync, and share through Evernote, Dropbox, email, and GDrive. If you'd like to take advantage of voice-to-text transcriptions you can order them for $1 per audio minute. The transcriptions are done by real live people, no computer transcriptions and feature a 48-hour turnaround and 98% accuracy. The transcriptionists are all trained and experienced and work 24/7, which is why you have such a fast turnaround time. They are able to review and edit the work so that what you have delivered back is of the highest quality. The playback engine on the app has been optimized for voice recordings, which is why you'll enjoy such clear and crisp sound. The app can even record in the background while you use other apps or if your phone goes to sleep. There is an automatic pause feature when you have an incoming call or other types of interruptions. When it comes to organizing/managing your recordings you can search for them by location, name, or date. While there are no in-app purchases you can choose to order voice-to-text transcription services for $1 per audio minute. This purchase can be made within the app. Version 1.3.0 introduced the ability to send your recordings to Dropbox from within the app, choose the folder you send it too, and have it done automatically. As well you can now pick between high and normal recording quality, a more streamlined ordering process of transcriptions, bug fixes, user-interface improvements, and performance enhancements. You can also view, share, and print transcripts from within the app (for your paid transcription order). The app currently has 34 customer ratings with an average rating of five out of five stars. There are plenty of recording apps out there but this one stands out from the pack by offering its voice-to-text transcription services that are so easy and quick to order. The price seems very reasonable and the fact that you’ll have it back within 48 hours is incredible. For: iPhone 3GS, iPhone 4, iPhone 4S, iPhone 5, iPod touch (3rd generation), iPod touch (4th generation), iPod touch (5th generation), and iPad with iOS 5.0 or later. Rev Voice Recorder is optimized for iPhone 5.